The Cobb2020 Partnership, a collaboration of community organizations and individuals dedicated to promoting healthy lifestyles and the delivery of essential health services in Cobb County, received a Community Transformation Grant (CTG) from the Centers for Disease Control and Prevention (CDC) to increase opportunities to prevent chronic diseases and build healthier communities. 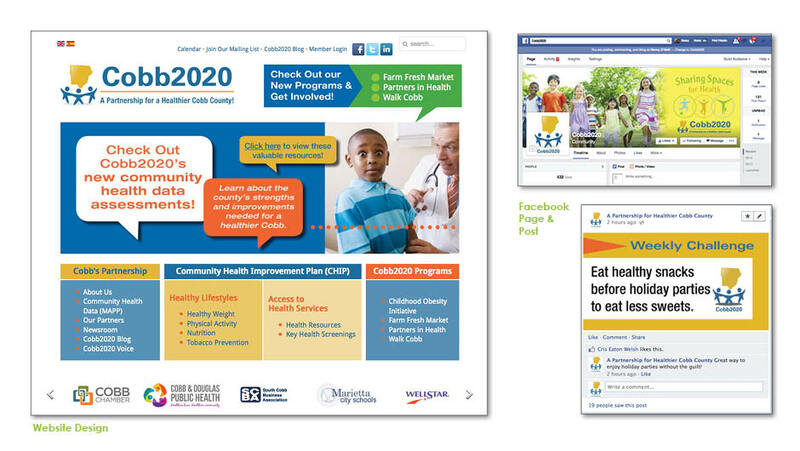 In order to generate public awareness, educate Cobb County’s community members and better connect with the whole county, Cobb2020 saw the need to establish a website in conjunction with social media outlets, that would reach target markets including low income and minority populations who were particularly at risk. 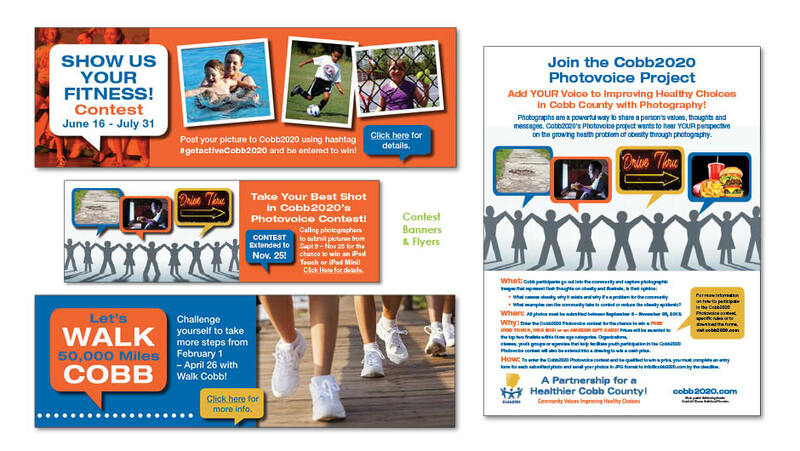 As part of a branding campaign, O’Neill Communications developed and designed Cobb2020’s online presence from start to finish with the construction of an informative and interactive website combined with social media platforms to connect with the Cobb community. 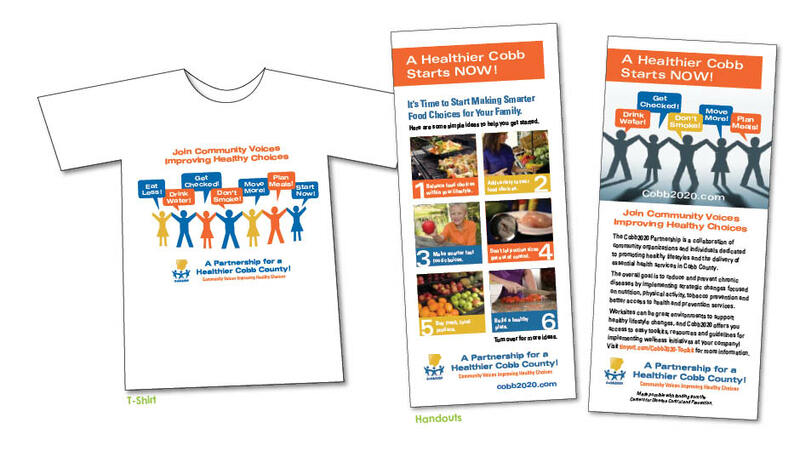 Based on an assessment of Cobb County’s health status and leading health issues, the website includes recommended action plans, weekly challenges, a robust calendar of community health events and other health-related resources. It also teaches people how to make simple changes to improve their health, the health of their families and the community’s overall health with easy suggestions for jumpstarting an active lifestyle while also including information on maintaining a healthy weight, ideas for physical activity and information on nutrition and tobacco prevention. In conjunction with the launch of the website, O’Neill Communications started a social media campaign with interactive Facebook, Twitter and LinkedIn pages that provide more opportunities for Cobb County residents to receive health updates, become involved in the initiative and embrace a healthier Cobb County. 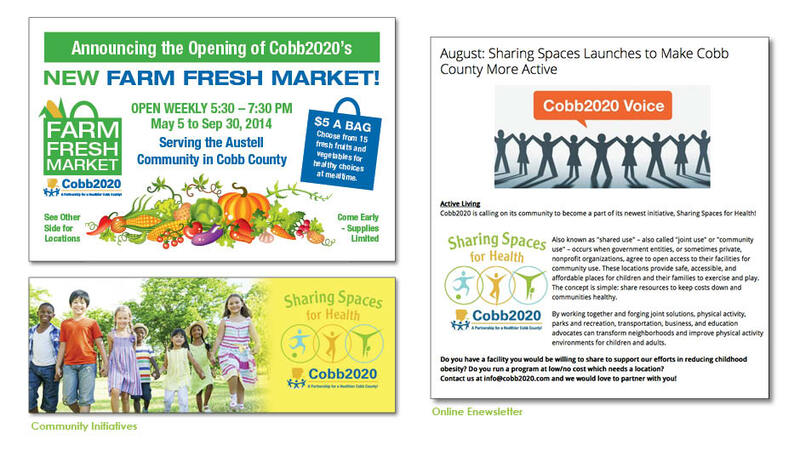 Within three months of launching the website and social media platforms, Cobb2020’s health initiative has gained strong exposure within the Cobb community. 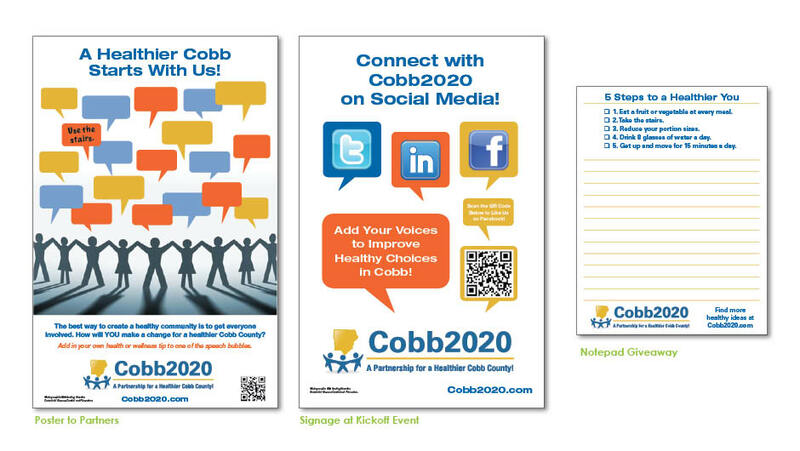 O’Neill Communications supervises, manages, and executes all communications needs for Cobb2020. We manage the website’s maintenance and website content such as graphics, written copy, photography and videography. Additionally, O’Neill writes and distributes the enewsletter Cobb Voice for Cobb2020, and manages all of the social media campaigns through Facebook, Twitter and Pinterest. O'Neill also plans and manages the organization’s anniversary event that is held every October and provide all print collaterals, media relations and promotions through the website and social media. 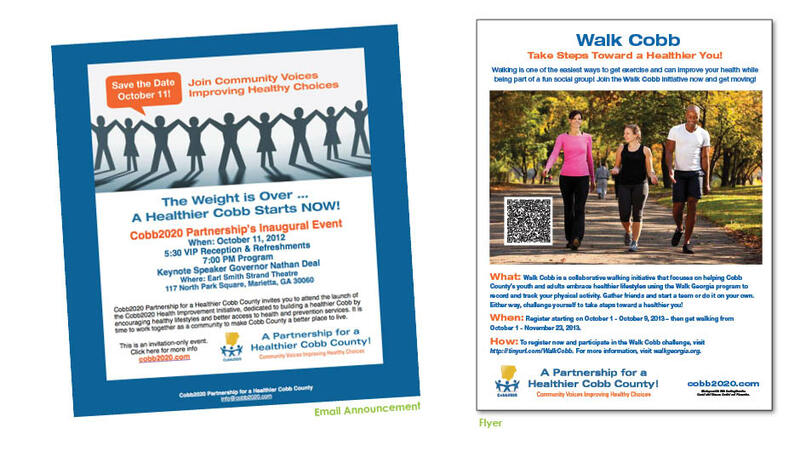 In order to generate public awareness, the Cobb2020 Partnership hosted an inaugural event, The Weight is Over … a Healthier Cobb Starts NOW!, at the Earl Smith Strand Theatre to launch its Health Improvement Initiative. 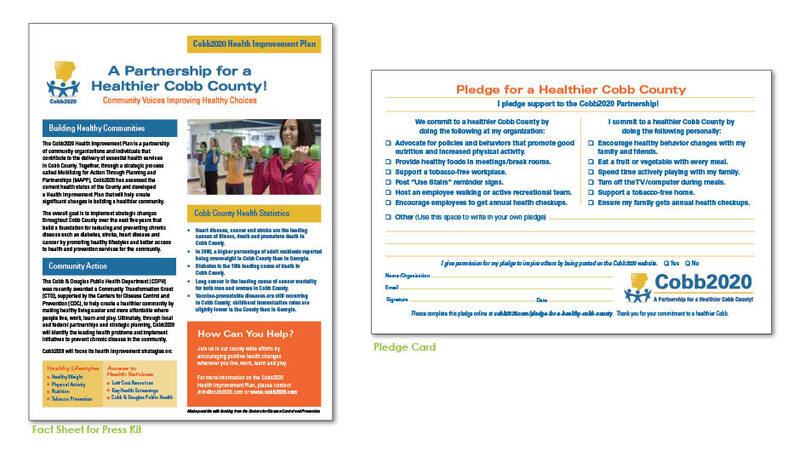 The purpose of the Cobb2020 event was to bring together community leaders to address health issues affecting Cobb County and to collectively take action and join the Cobb2020 Partnership’s Health Improvement Initiative. O’Neill Communications knows it is imperative to build relationships with the media and used the launch event to establish connections with local sources including the Atlanta Journal Constitution, Marietta Daily Journal and WSB. Our firm engaged in a media relations campaign that consisted of both advance and post event coverage through a series of releases, dissemination of a press kit and direct contact with local reporters. Community participation was at its best, with more than 350 attendees from Cobb County attending the launch event. Over 175 attendees filled out the pledge card commitments within one week of the event. The media relations campaign sent out seven press releases and garnered coverage in several media outlets including the Marietta Daily Journal, Cobb in Focus and WSB. The launch event helped kick off awareness of Cobb2020 Partnership’s Health Improvement Initiative, attracted more visitors to the website, established relationships among the local media and opened opportunities to form partnerships with key leaders in the community who can help make significant changes in building a healthier Cobb County.